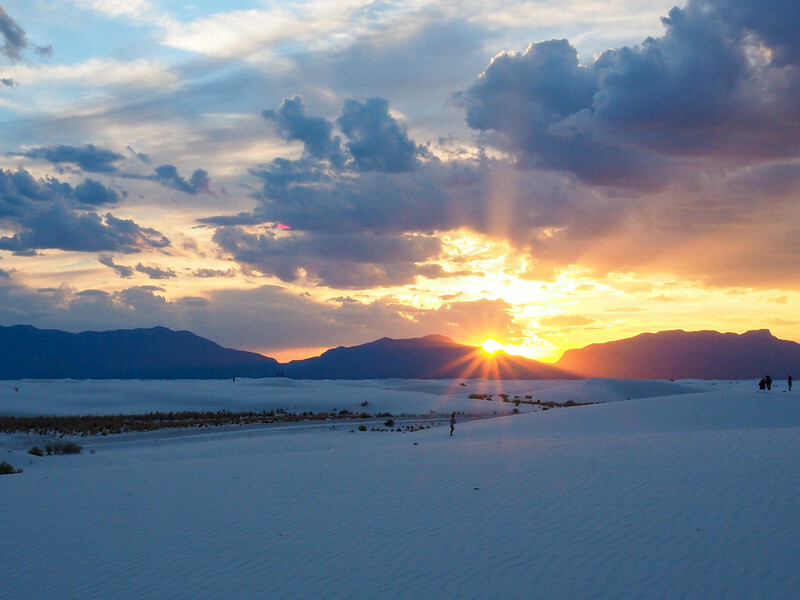 White Sands: The Most Underrated National Monument? 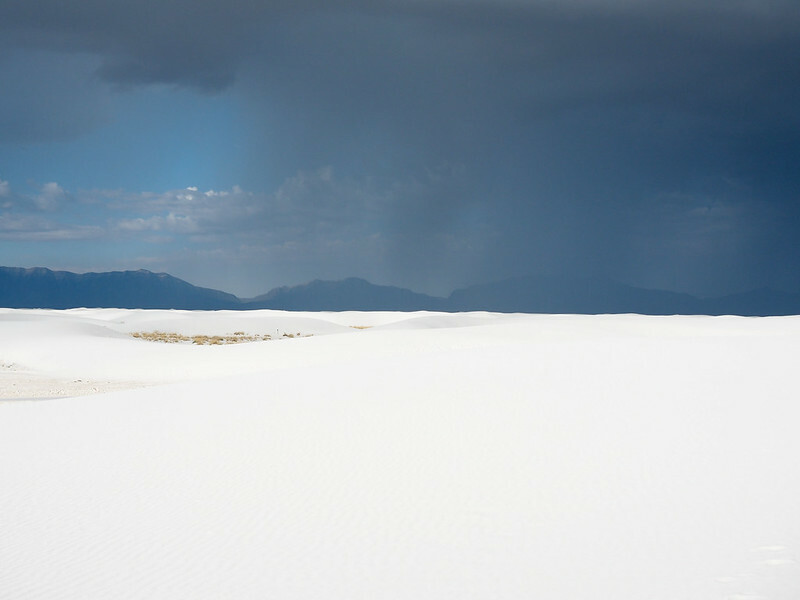 Home » Blog » United States » White Sands: The Most Underrated National Monument? When it comes to national parks in the U.S., you've probably heard of all the “big ones” – the Grand Canyon and Yellowstone and Yosemite… they're familiar to most Americans (and even to many non-Americans). But the National Park Service manages much more than just national parks. In fact, the NPS manages more than 400 areas through the U.S., including national parks, monuments, battlefields, historic sites, lakeshores, and more. And many of these are severely under-appreciated. 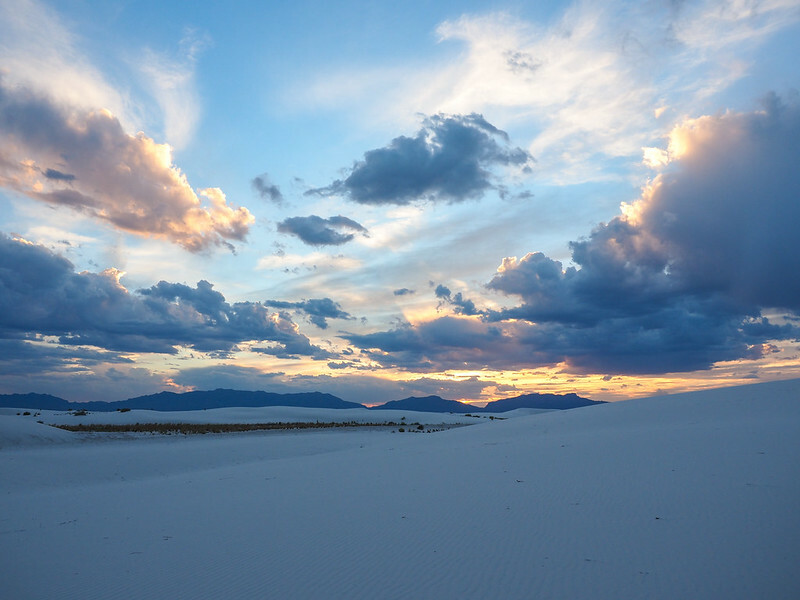 Ever since I first saw photos of White Sands National Monument when I was in college, it was a place I knew I wanted to visit. I mean, what's not to love about rolling acres of white sand dunes, right? 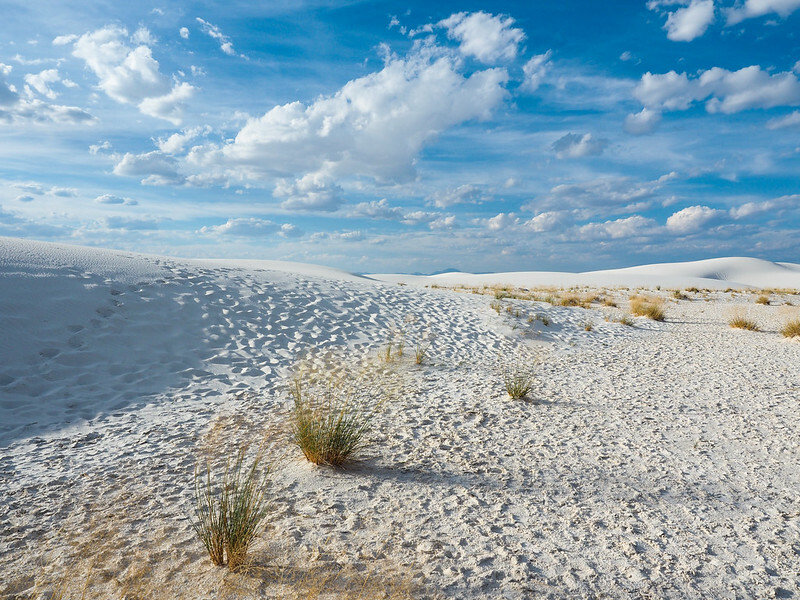 White Sands lies in the Tularosa Basin in the northern end of the Chihuahuan Desert in southern New Mexico. 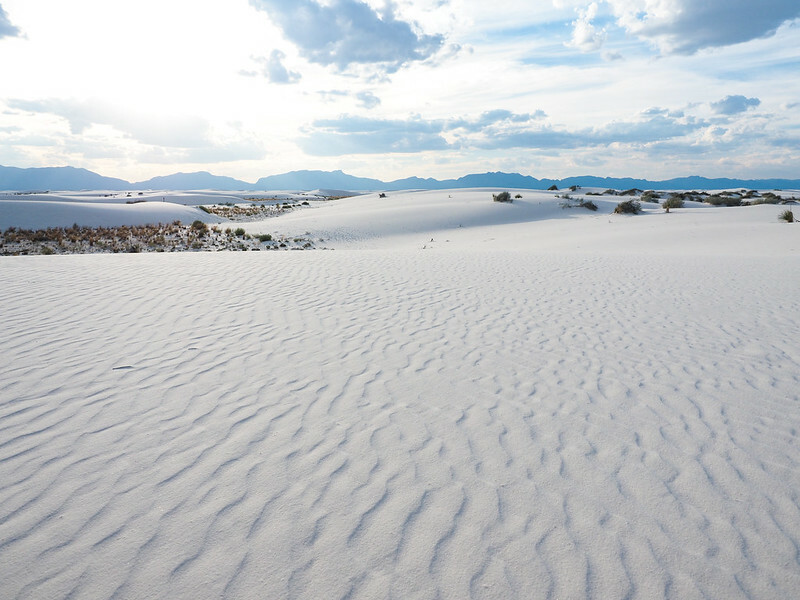 It's made up of 275 square miles of gypsum sand dunes – in fact, it's the largest gypsum dune field in the world. The dunes were formed after the evaporation of an ancient sea and survive because of little rainfall and no way for water to flow out of the basin and take/dissolve the gypsum with it. The first time you see the dunes, you'll do a double take, wondering whether you're looking at pure white sand or snow drifts. Speaking of the first time you see the dunes, it took me quite a few years to make it to this part of New Mexico. Even though I've dreamt of going for ages, the problem was that White Sands isn't exactly the most convenient place to get to. The closest city is Alamogordo, which is at least 3-4 hours from Albuquerque and requires you to have a car and some patience for driving through desolate landscapes and military missile ranges. Because of this, it took a few years for me to finally get there. But the wait was SO worth it. According to the National Park Service, the weather in the Tularosa Basin is usually clear – sunny skies for approximately 330 days out of the year, they say. So imagine our surprise when my friend Lisa and I pulled up on a Saturday morning to find dark storm clouds and rumbles of thunder! Thankfully, we had also visited the park the evening before, when the skies had been mostly clear. Seeing the dunes in such contrasting conditions was interesting, though – the sand took on a totally different color under storm clouds. 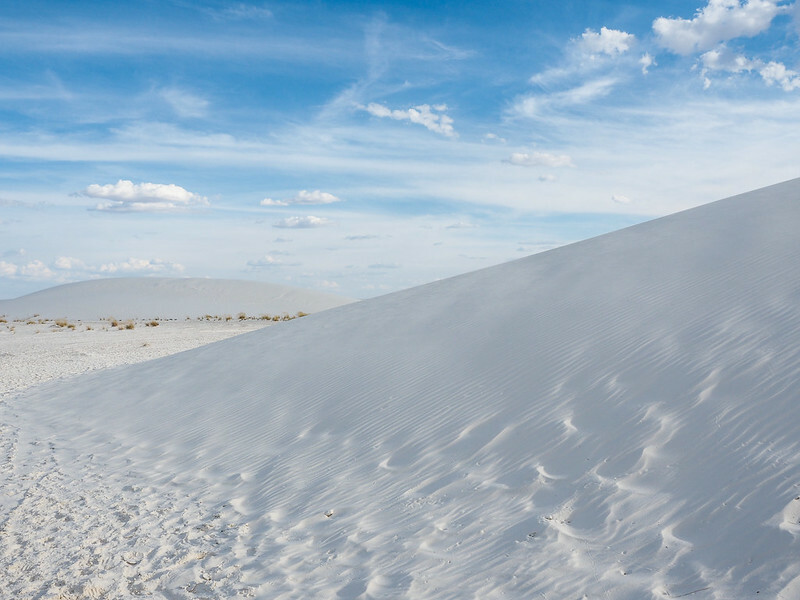 At White Sands, it's the unique dune environment that's being preserved. 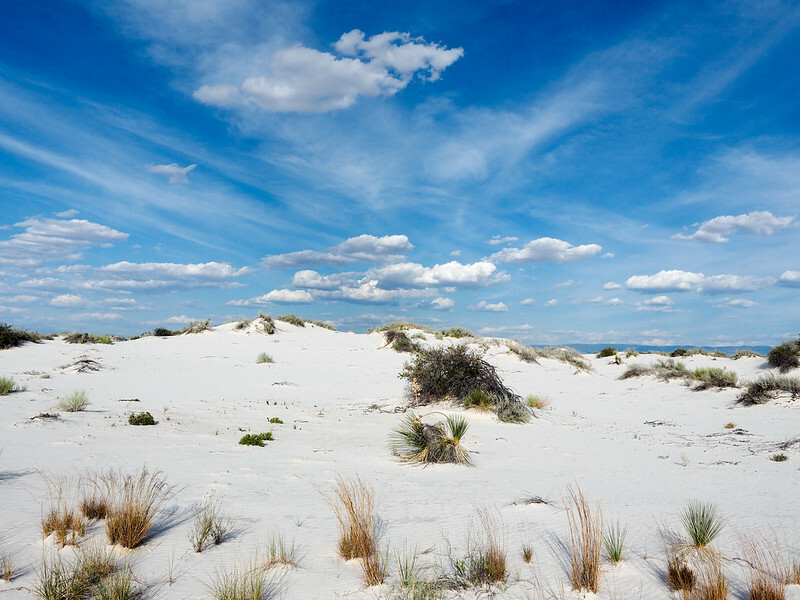 The gypsum dunes are home to a unique ecosystem of plants and wildlife, many of which only exist here in the northern end of the Chihuahuan Desert. 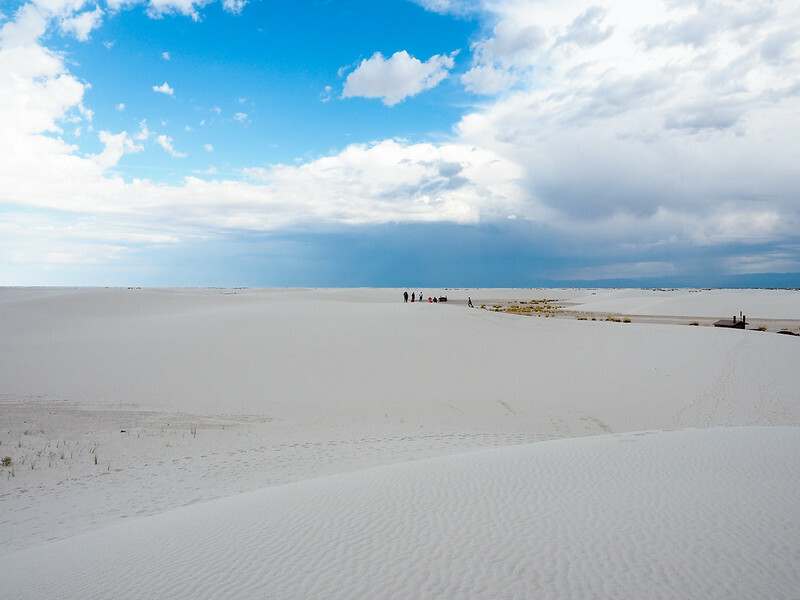 Along with wanting to preserve the dunes themselves, the NPS decided to protect White Sands for scientific reasons, too – many scientists refer to this area as “” because of the rapid evolution that has taken place here. For example, both mammals and reptiles have adapted to the dune environment by “shedding their colors” and turning almost completely white in order to blend in with the surrounding environment. Plants, too, have adapted to survive in such a harsh environment. Some extend roots down far enough to reach water (meaning many are as tall as the dunes themselves); others “build” pedestals around themselves in order to stay on top of the shifting sand. Mother Nature is pretty incredible, and visiting a place like this is a good reminder. 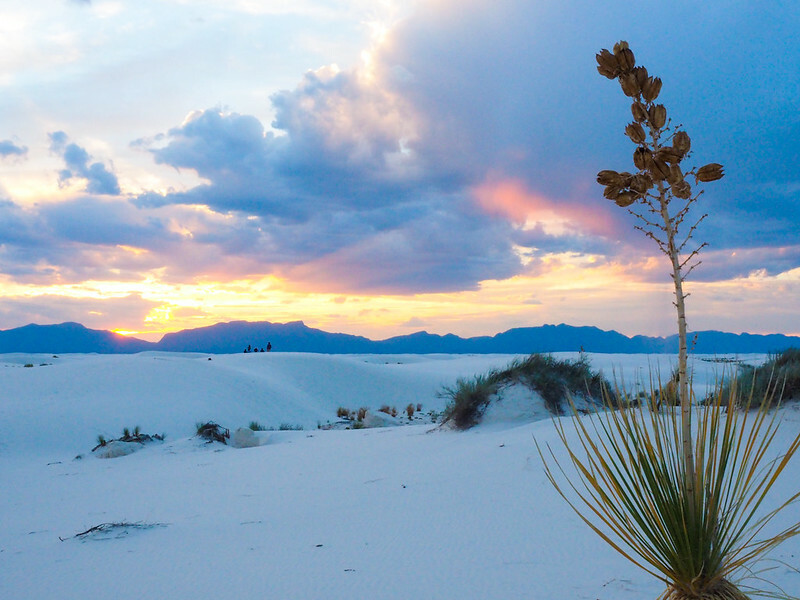 So what exactly does one DO at White Sands National Monument? That's a great question. And the answer is – pretty much whatever you want! Climb the dunes – The towering walls of white might look daunting, especially if you've climbed other dunes before made of loose sand (and maybe possibly thought you were going to die in the process). 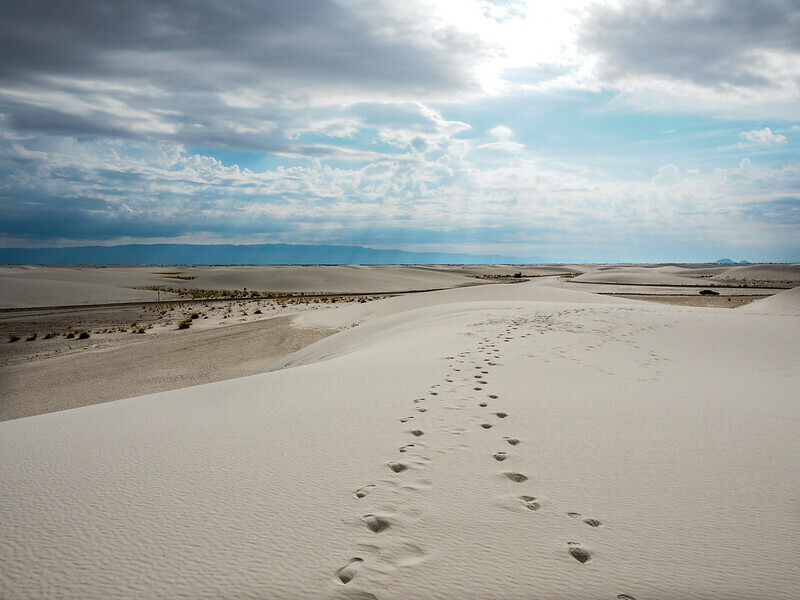 But the dunes at White Sands are actually fairly wet beneath the surface, meaning they're incredibly easy to walk on (and also aren't likely to burn your bare feet). Drive all the way to the back of the park where the loop is. Then pick a place to park and get climbing! Go sand sledding – Some of the dunes are steep enough to resemble hills of snow, and you're bound to see people armed with plastic sleds on at least a few of them. This is absolutely allowed – and even encouraged! – at White Sands. You can either bring your own sled, or purchase one at the visitor's center on your way in. Have a picnic – You're free to bring food into the park (so long as you dispose of your garbage! ), and there are some funky covered picnic tables in the loop section of the main road. 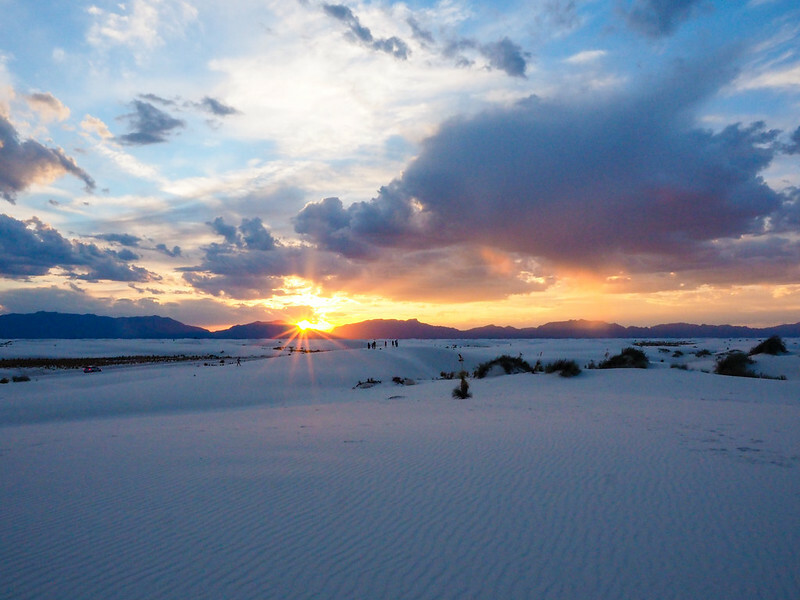 Take a free hike with a Ranger – There are hikes you can tackle on your own at White Sands, but if you're only going to do one, I would recommend the Sunset Stroll. This is a free one-hour guided hike through the dunes before dusk where you'll learn about the area's geology and flora/fauna and then be in a perfect position to watch the sun set over the sand. 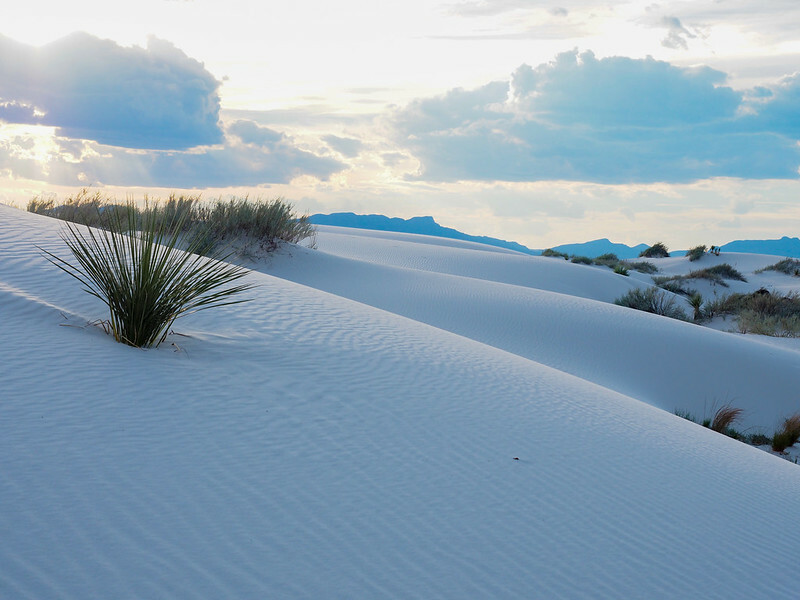 Check out all the Ranger Programs at White Sands . Watch the sunset – Speaking of sunset, you don't want to miss it! The dunes turn shades of blue and pink under the setting sun, and, believe it or not, you won't have to compete with tons of other people to watch since there are plenty of dunes with great vantage points. Bring water – DON'T underestimate how quickly you can become dehydrated in a desert environment like this. While there are some picnic tables and porta-potties out in the dunes, there's nowhere to buy food or water. Be sure to stock up on water beforehand (buy some at the visitor's center if you don't have any), especially if you plan to do any amount of hiking. because they went hiking in 100-degree heat with no water – don't be one of those people! Beware the sun – To go along with the above tip, be sure to apply (and re-apply) sunscreen, too. With 330 sunny days per year and a surface that reflects sunlight right up into your face, this is an easy place to get a sunburn. Go early or late in the day – It can get HOT here (it is a desert, after all), so to avoid the highest temperatures, go early in the morning or later in the day. Lisa and I went around 4 p.m. and stayed until dark in early October, and the temperatures were just about perfect. 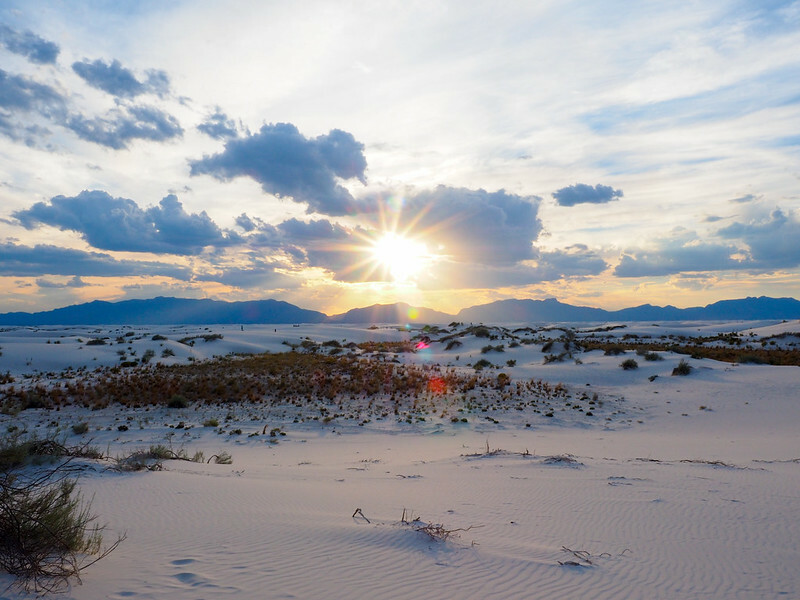 Check for closures – White Sands National Monument is right next to the White Sands Missile Range, so closures for military missile tests are not uncommon. In order to make sure you aren't surprised, be sure to take a look at the ahead of time. 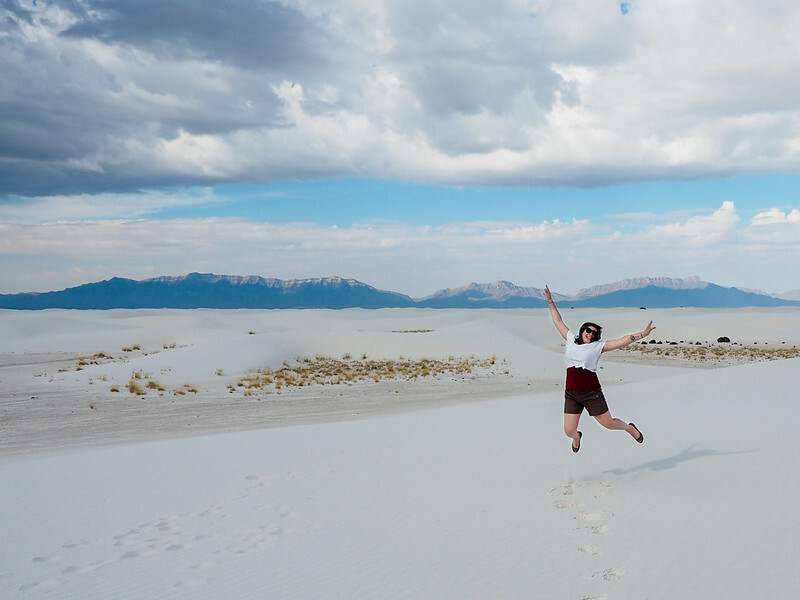 It took me years to finally make it to White Sands – but the wait was well worth it. The dunes are just as incredible in real life as they look in photos (in fact, they were even softer and cooler than I'd imagined), and the fact that we didn't have to compete with thousands of other tourists made the experience felt like it was all ours. 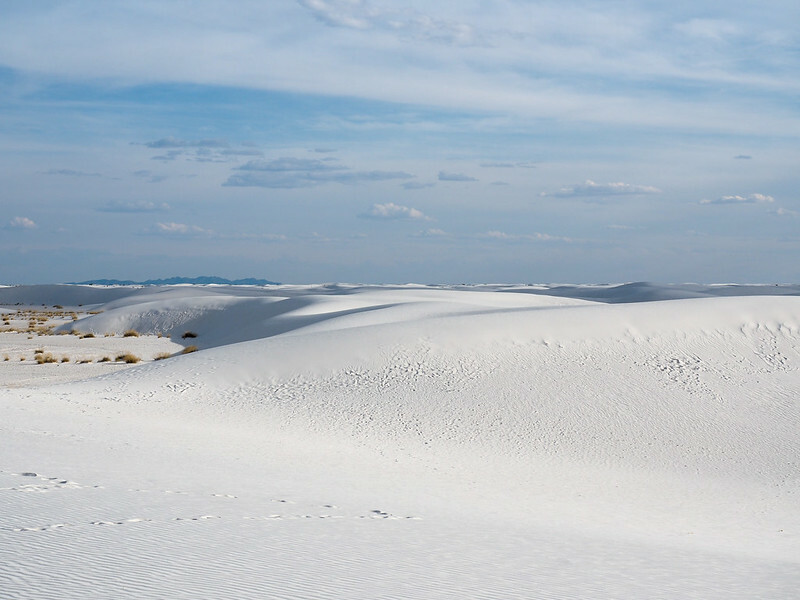 I haven't been to EVERY National Park Service-managed area in the U.S., of course, but I have to wonder if White Sands might be one of the most underrated. You don't hear a ton about it, and yet it's one of the most unique and beautiful protected areas I've had the pleasure of visiting. 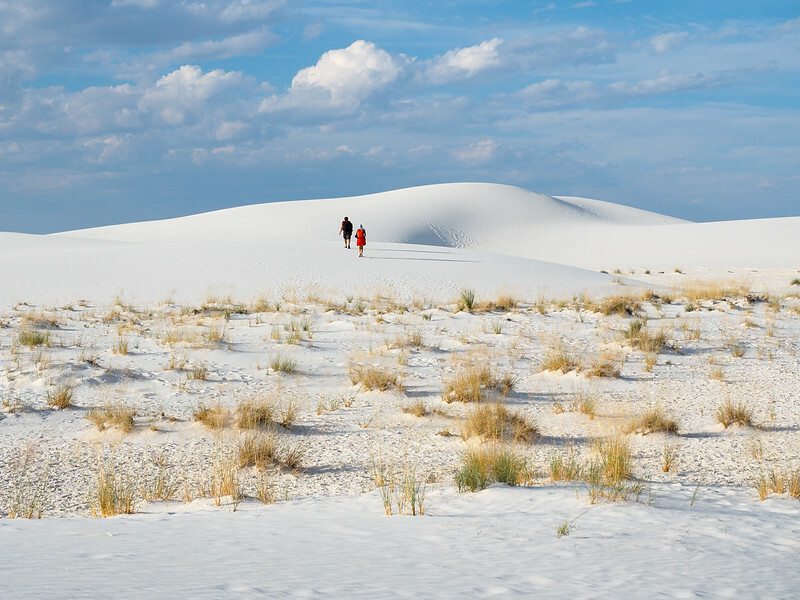 Needless to say, if you can make a trip to White Sands National Monument while you're in New Mexico, DO IT! Have you ever heard of White Sands? Would you like to go? My dad was stationed there when I was really little. I went sledding down sand dunes before I ever even saw snow! I’d love to get back there someday! Fun! My friend and I kept commenting about how awesome White Sands must be for kids! I just visited this area yesterday and was completely enchanted. It was a beautiful experience and I can’t wait to go back. I, also, had a rain storm come through, but it only made the experience more special for me. The dramatic clouds over this never ending field of white. I definitely wasn’t expecting the sand to be so damp and cool to the touch, I ran around bare foot the entire time and nearly filled up my phone with pictures. Haha! Just as we left, the storm clouds let loose everything they had and dropped a thick sheet of rain over us, then the hail came. It was a bit scary, but luckily the intensity of the storm dropped after a few minutes. For the first time visiting New Mexico, it really put on a show! Sounds like a great time, Ruben, even with the storm! 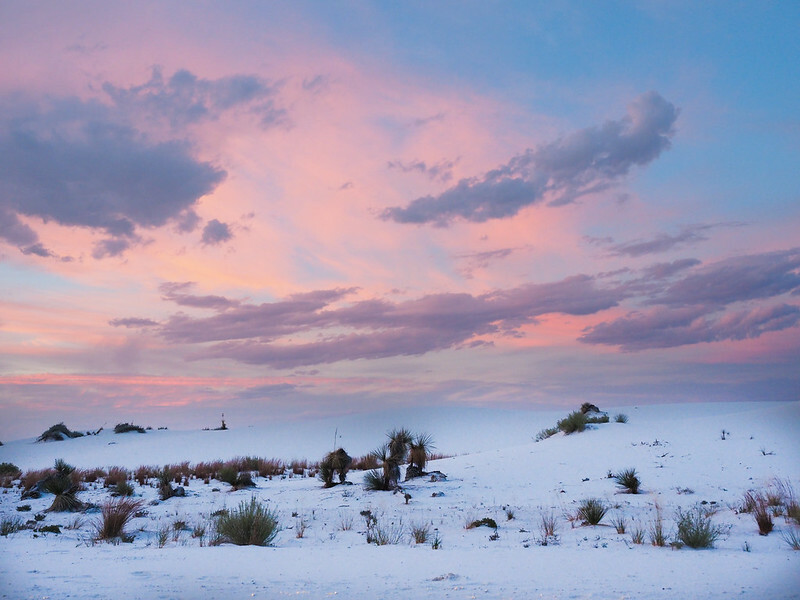 White Sands is definitely an enchanting place! I’m so impressed with the Wind Sands only by looking at your photos – can’t even imagine how awesome is to actually be there. I’m not sure will I ever have a chance to visit it, since I live on the other part of the Globe, but I would try to remember it if I ever make a big road trip through the States. 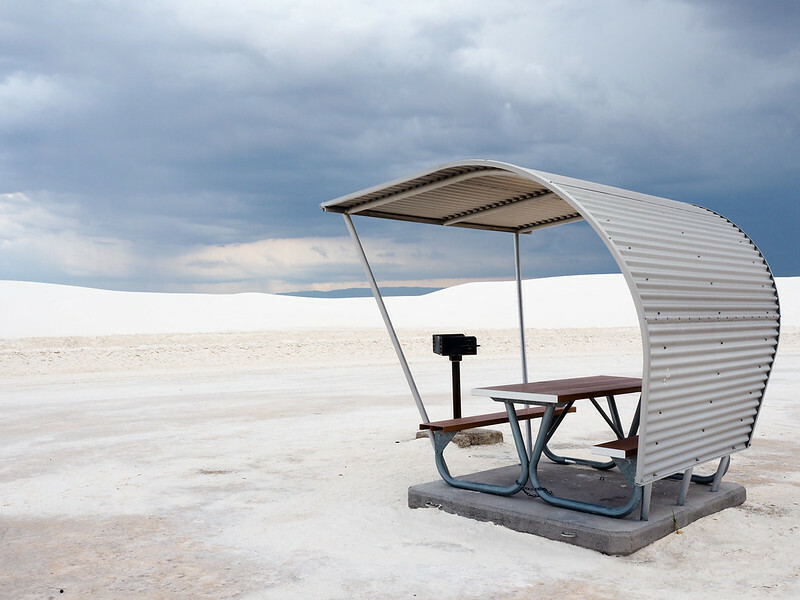 Road tripping through the States is awesome – and White Sands would make a great stop! Wow this is beautiful, I’ve never heard of this place. Thanks for sharing. Glad I could introduce you to it, Stef! Akatuki, the pictures are just amazing! I’ve never heard about White Sands but would love to go. I loved it so much – totally lived up to my expectations! Wow. We have some unexpecting landscapes in Thailand, but nothing like this. Super cool. Did you take a shot at sand sledding? Also, is there camping? I didn’t do any sand sledding (my lenses would have been wrecked if I’d gotten sand in my eyes!). As for camping, I think you can bring a tent if you plan to do some hiking and then get a camping permit. These pictures are very pretty. If I had the opportunity, I would definitely visit. I would highly recommend it! It’s not super easy to get to, but is SO worth it! Wow! I didn’t know about this place, but it looks gorgeous. It’s pretty incredible! Glad I could introduce you to it! 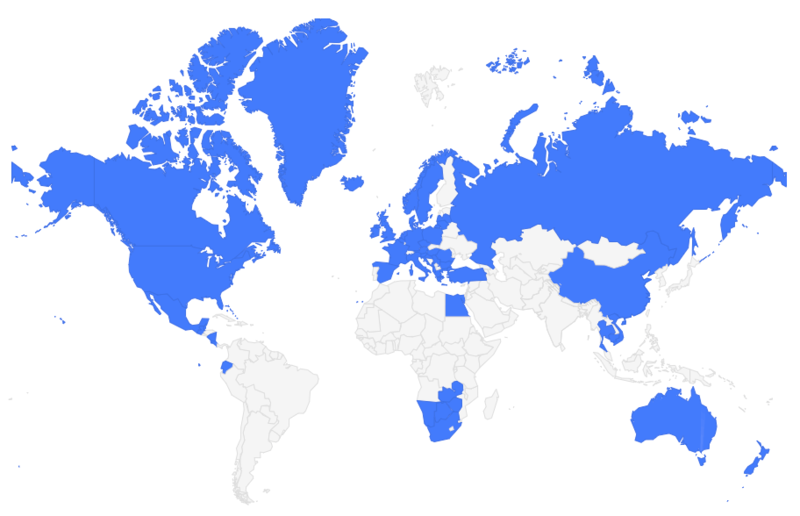 Its amazing how many smaller places there are to explore in any country. One of my favourite places in the world, and definitely in Australia is this national park near where I grew up and most people don’t know it exists! I think I prefer it that way for the time being. And it’s especially true in large countries, like the US or Canada or Australia. There’s no way to ever truly explore it all! I’ve never actually heard of this place to be honest, but it looks absolutely stunning! I’m glad I wrote about it, then! It seems like quite a few people have never heard of it! It would be much closer to fly to El Paso, TX. From there, it’s just a 1.5 hr drive. Good tip! My friend I was traveling with lives in Santa Fe, so it made much more sense for me to fly into northern New Mexico in this case. I’m always amazed that such beautiful things exist in the US because you never hear about them! 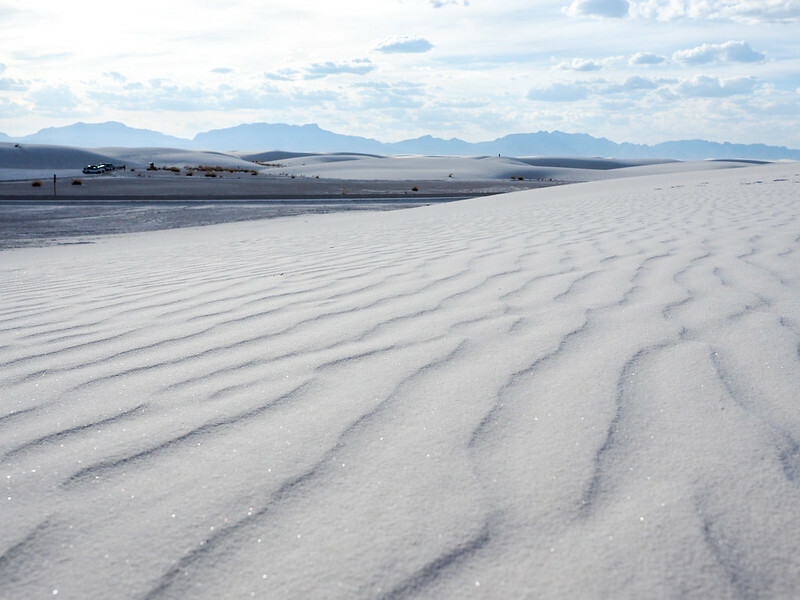 These white sands look amazing and I can only imagine what it’s like up close. Definitely adding it to my to-do list. Thank you for sharing! Wow! Like most non-US travellers our visits to America have mainly focused around cities.Your photos have made me revise the wish list for our next trip! This place looks stunning! I’ve seen precious little of the US’s amazing national parks and definitely need to change that – starting here! I actually visited White Sands, probably about 15 years ago! Totally agree, it is a beautiful place! Nice! Most people I talk to have never heard of it! Glad to hear you enjoyed it, too! Nature is amazing! It’s incredible what it can manage to overcome. This place looks right up my alley. I can’t believe I haven’t heard about it. I can’t wait to go! You certainly aren’t alone in not having heard of it! It’s crazy how many amazing protected areas are in the US – and we often don’t even know about most of them! Those white sands are incredible, and I’d love to go sand sledding. Have you tried it? I didn’t try it here (I wear lenses, and they don’t mesh well with sand! ), but I’ve done it elsewhere and had a lot of fun! Glad I could introduce you to it! And yeah, the dunes look like snow drifts, don’t they?? Spectacular pictures and place, love the contrasting conditions of the dark clouds and the clear skies! It’s such a gorgeous place – I’m so glad I finally got to see it for myself! It sounds as though I am not alone in never having heard of this place before. I love that no matter how much you travel there are always more places to discover! I always joke that, the more I travel, the LONGER my bucket list seems to get! where did all that sand come from? Is there a beach around? Nope, no beach! Millions of years ago, this used to be underwater. As the lake/sea evaporated, the sand was left behind! Definitely have to see if I can squeeze it in. Highly, highly recommended!! A lot of people don’t even know about it, but I don’t think anyone would regret visiting! Thanks, the tips here on your website are really really helpful! Like we would have never thought of checking the planned closures of the White Sands. They happen quite often so it’s great to know about this when planning. Although the link doesn’t seem to work (but I found it again: ). Thanks for another great post! I know I’m late to this one, but I really enjoyed your focus on what the monument is all about. We almost crossed it off our road trip list to save time. So glad we didn’t. I agree this is an overlooked gem. “Overlooked gem” is exactly right! It’s not exactly convenient to get to, but once you’re there it’s so incredible! I googled “why visit WS” and this artical came up. Your description and pictures are really good. You have insipired us to visit some. Should be perfect hiking in November.